The holidays are upon us. And that means so is holiday music. I have to admit I used to dread the month in between Thanksgiving and the new year and all the seasonal songs I heard over and over in stores, on the radio and even sung in many of our classes. But a few years ago something happened. A switch was flipped and suddenly I became obsessed with the very music that used to make me cringe. There is something in the spirit of holiday music that really inspires me as I end the year. I don’t love it all and am discerning of course, but now I make it a mission to find new holiday songs every year. My collection is vast and ranges from classic soul to modern pop to vintage country and everything in between. I can listen to Ella Fitzgerald’s Swinging Christmas on repeat and think Mariah Carey makes a great Christmas album. It has noting to do with my faith or my any of the commercial aspects of the season. It’s just the music in my heart and when you find that, play it loud… no matter how many times you’re told to turn it off! In our music classes and holiday workshops shine educators love to riff with the students and make up their own holiday songs. Here, Shine Music Specialist Taylor Shapiro shares some other creative ideas on how to infuse wintery inside time with music and togetherness. There is nothing better than claiming ownership over a self-invented song. 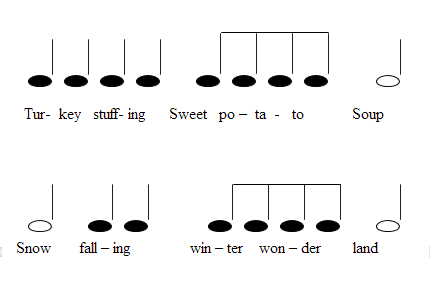 Take a well-known melody and create new words, relevant to your topic of choice. Better yet- if you own a pitched musical instrument, compose an original melody with lyrics. First, pick a music style- jazz, contemporary, folk, rap, R&B, hip-hop, classical, country, rock & roll, etc. Then, choose a theme or underlying message. Children I’ve worked with go back to common themes such as friendship, family, love, toys and animals. Sometimes it makes more sense to decide on a theme and then a complimentary genre. If you have certain instruments in your home they may inspire the composition. There are endless possibilities. Don’t forget to stop, collaborate and listen! Put on a family musical! Children naturally love to sing and dance. Some children’s classics include Annie, Mary Poppins, The Sound of Music, and Peter Pan. Listen to Broadway hits on iTunes, download the instrumental version, give each member of the family a part in the play/musical and act it out. Add some choreography and call over the neighbors to be part of the ensemble. This is fun because it’s physically, musically and mentally engaging for all!